You might think these were sweeping legal reforms that greatly improved American society. Or perhaps you view them as stopgap measures intended to right some grave social injustice. What all these instances of reform share, however, whether sponsored by Democrats or Republicans, is wildly unforeseen consequences--occasionally positive, often regrettable. 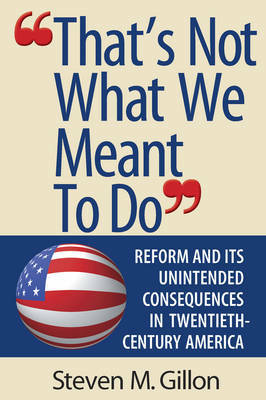 With a shrewd eye for historical absurdity, Steven M. Gillon takes us on a tour of this century's reforms and legal innovation -- federal welfare policy, community mental health, immigration, and campaign finance reform, to name an additional few--and describes the unintended consequences of their enactment. The result is a brisk, instructive, and disturbing study that will be required reading for all students of government and society, and for anyone who wishes to avoid the perils that stalk any legislative body.